Welcome to my architectural photographer web page – one of the most important pages on my website (so if you only read one page please read this one). Which images do I want on a web page all about my architectural photography? for inspiration. Exactly what is architectural photography? What does an architectural photographer do? Why should I pay an architectural photographer when I can take the photographs myself? A very commonly asked question. The short answer is this - you don’t have to. If you are happy with the photos taken on your own camera/ iPhone then fine. I pride myself on providing a high quality professional service on every job. I am not cheap, and if you are after the cheapest photographer it will not be me, since I provide high quality pictures and a high-quality service. I provide this high quality architectural photography for, amongst others, architects, builders, commercial agents, interior designers and property owners. Ok enough about me – lets talk about the 12 images I have selected for this page of my website. I wanted a mix of old new, traditional and modern. This is a picture of the Dorchester Fire Station and Dorset Fire and Rescue Service (since merged with Wiltshire to form Dorset and Wiltshire Fire and Rescue) HQ building at the point of completion of the works. This site is in Poundbury on the outskirts of Dorchester, which is a unique development on land owned by the Duchy of Cornwall. And a fascinating place to take architectural photographs. I was commissioned by the architect Calder Peel to photograph the completed buildings, constructed by Morgan Sindall. One thing about this image. This is pretty much a straight, clean, technically correct architectural image. Apart from the tarmac, which was scarred all over the place – which is why I darkened it to hide all that horribleness which also made the front façade stand out even more! Another brand-new building in Poole, this is the Joint Emergency Services Building, also known as Poole Police Station. This building was photographed for the architect Calder Peel and main contractor Morgan Sindall. This is a side view, a much lesser known view. Why did I take this picture from here? Well I already had a picture of the front of the building. Quite a few actually. And as I knew the building very well I knew where an essential component of this image would appear from – a police car leaving the building via the main vehicle access. All I needed to do was set up my camera and wait for a police car to appear. And of course, not to be arrested. And there it is. A picture that tells a story. The story of a police station. I was photographing an extension to the most fantastic private library you could possibly imagine. The interior was amazing. But that is a story for another time. Or another page on my website, my interior photographer page. This is one of those detail shots. A bench in front of a window framed by a rainwater pipe. I like the warmth of the stone being warmed by that lovely sunshine. I like the texture of the stone. And against that the man-made window and rainwater pipe. Just a picture of a bench. A detail shot from a shoot commissioned by the Architect, Andrew Stone. To finish with the stunning Duomo di Firenze. 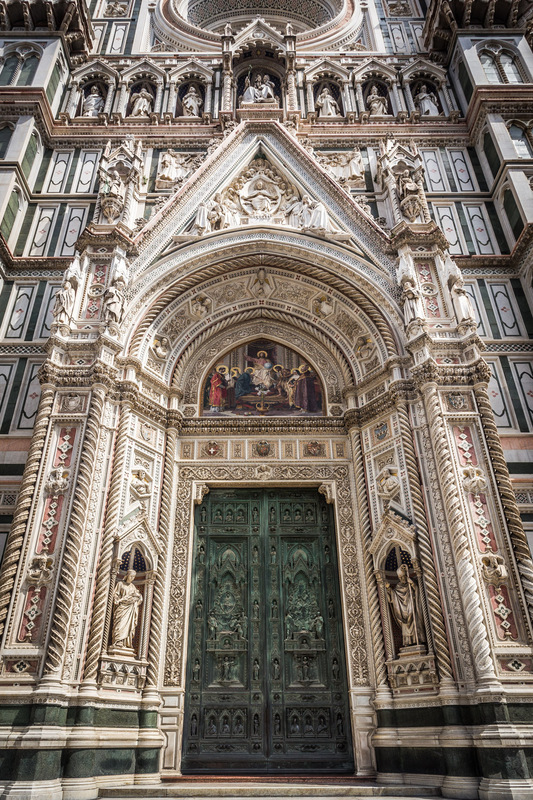 Or The Cattedrale di Santa Maria del Fiore. Gothic architecture with an exterior covered with marble panels in shades of green and pink bordered with white. Duomo di Frenze is part of a UNESCO World Heritage Site. The first picture is of the front façade. Enormous. Striking. Unusual. If you are a fan of architecture like me, this is a façade so grand it almost defies belief. Started in 1296, completed structurally well over 100 years later. And I try to capture all of this in one photograph. I decided to keep all the people in the shot, as they are part of the modern story of this iconic building. I could have done something clever and complicated to exclude all the people, but I will save this for my return to Firenze, which I have every intention of making at some point in the future. Hopefully you like this image, and get the feeling of the scale of this magnificent structure. 5 – Tower Bridge. London. A truly iconic London landmark. Tower Bridge. But photographed from below, from the riverside footpath in front of the Tower Hotel by the side of the River Thames. I like different viewpoints, and managed to get my timing right so the sun was glinting of the shiny painted metal of the bridge deck. This picture was taken using my Canon 5D with good old faithful Canon 17-40mm lens. This is a single image capture, processed in Lightroom before being cleaned up and the edges fixed in Photoshop. I know that we have all seen endless images of Tower Bridge, but not that many pictures taken from this angle, which for me gives an interesting viewpoint and emphasis on the bridge itself rather than the London cityscape pictures we see. This is a different view of The Shard, taken in daytime, just before 2pm one cloudy summers day. I know – it does not look like it was taken during the day, but it was. The metadata recorded by my Canon 6D confirms this. You know all those pictures you see of buildings with a black sky. I’ll let you into a secret. Some of these pictures were probably not taken at night. This picture wasn’t. This picture is a result of an HDR Merge in Lightroom of a two stop under exposed image along with a two stop over exposed image, merged together. This gives the extended dynamic range. And then some tweaking in Lightroom before adding a blur in Photoshop and voila – there you have it. A completely different interpretation of a scene. After all the splendour of the front façade of the Cattedrale di Santa Maria del Fiore in Florence I wanted to include a picture from the return visit I made the year after. And this is that picture, of one of the huge doors on that front façade. This image is all about the intricate detailing in the doors and the surrounding stonework. All those details and textures in wood, stone and marble. 8 – The Jigsaw Building at the Royal Bournemouth and Christchurch Hospital. I hate to say the pigeon made this shot, but you know what I mean. Now unlike other things, this was pure luck I take no credit for the pigeon. I was just photographing this façade of the building, which was still under construction. Yes, I know you can’t tell – that is part of my job after all! Interesting patterns and colours in this cladding, broken up by the horizontal lines. This is one of those picture that works really well in black and white. I will produce a new black and white version of this picture which I will post on my photography blog so make sure you check out this page of my website which is updated every day. This picture was taken for the architect, Kendall Kingscott. This picture shows the refurbished block set in the context of existing buildings. This is a kind of composition I like to include in a shoot, showing the impact of construction works to the immediate surrounding environment. In this picture of the recently completely refurbished block, I have deliberately overlapped the old building on the left with the brand new white façade of the refurbished block. This kind of picture is useful for architects and developers in developing future schemes of works. The main contractor for this refurbishment project was Raymond Brown Construction, the architect Kendall Kingscott, and the client was Hampshire City Council. The picture was taken with my Canon 6D, Canon 17-40mm lens, both sat securely on my Manfrotto tripod. I photograph lots of refurbished buildings. The extent of refurbishment varies massively. For this school in Hampshire the refurbishment was all the external walls and the roof. In addition, as a part of the remodelling, a new main entrance was constructed to the front of the school. I like this picture of the extension, constructed from timber and clad in cedar. The canopy above the front entrance is a nice touch, offering shelter and a touch of style. Nothing fancy, but it works well. This picture was taken for the architect Kendall Kingscott at the point of practical completion of the works. Dawnus Construction were the main contractor on this project, and the client was Hampshire County Council. This picture is taken from a bracketed set of three images captured on my Canon 6D. This was one of the first pictures to make it into my BIPP portfolio set. This picture of the new entrance to the Library at the Winchester School of Art, part of the University of Southampton. The picture was taken for the architect Kendall Kingscott. This was a genuine after the sun has gone but there is still daylight picture. It is also an HDR Merge of two images to get the lights, darks and everything else in the middle. And there has been an amount of cleaning up of this image in Photoshop, especially to the pedestrian area around the benching and bin. And what a feature that bin is, with that fantastic lighting on it. Finally a picture of a very stylish new home in Poole photographed for the architect Kendall Kingscott http://www.kendallkingscott.co.uk/. This project was the construction of a pair of new homes on a plot not far from the sea. Nice. The houses were constructed by Spetisbury Construction. The is the front elevation of the left-hand building. The picture was taken with my Canon 6D on my Manfrotto tripod from eye level. I do have an alternative version taken using one of my specialist bits of high access photography equipment. My Harris painters pole. With a special adaptor. You can view the image taken from the right-hand side of this building on my home page. But back to this image, and the story I have to tell. Another example of finished works being subject to debate, and in this instance half an hour in Photoshop removing stuff! Removing stuff is my Photoshop specialism. Things I have to remove regularly include chewing gum, loose gravel, builders’ debris, hosepipes, rubbish, the odd person. And the odd van. And stuff sticking into an image from the side - one of my pet hates. Cleaning up my images is an important part of my digital processing workflow. That was my 12 examples of my architectural photography work. I have only included here architectural pictures of building exteriors – I have a separate page where you can see a set of my pictures of the interiors of buildings, on a page called interior photographer (surprisingly). Time for another regularly asked question (I didn’t want to use “frequently asked questions – that is too obvious). How much do architectural photographers charge? Or more importantly – how much do I charge? I price my architectural photography on a time basis, normally on a half day rate or a full day rate. My rates include all other costs, including processing of the images. My rate is built up from the time spent on site and the time spent processing, plus any other additional things such as licensing, image use etc. Last question – do you have any specialist equipment for taking pictures of architecture? Oh yes. I do indeed. I have a cupboard full of photography equipment. I use the following most of the time. Quite often, especially interior architectural photography, I use my 17-40mm lens and nothing else. I always take architectural photographs using my Manfrotto tripod with geared head. The geared head is invaluable to me in precisely composing architectural images. I also use a Loupe viewer which is attached to the back of my Canon 6D. This also allows me to precisely compose my image, even in bright sunlight. This is one of the points of employing a specialist architectural photographer – precision of composition is vital to the capture of technically excellent images. I also have lots of other bits of kit that I use as and when required by the situation, including a Harris painters pole (as mentioned on the picture of the house on Poole above)! No seriously this gets some use and gives me a different perspective. I also have a Platypod Pro, which allows me to put my camera on the ground, a scaffold, shelf, ledge, well anywhere really. It is this collection of specialist equipment that allows me to get shots from all angles. Going back to my previous point you won’t be able to do all of this with an iPhone. As well as the equipment, which allows me to take pictures, I have a couple of technical image capture things that I do which enable me to record the maximum amount of information in a scene. Finally, I have an image processing workflow which enables me to consistently produce technically correct images. All the colours as they should be. No leaning buildings. No converging verticals. Correct colours. I hope that, having read all the way down to the bottom of this page, you know enough about me and how I can help you with your architectural photography need.